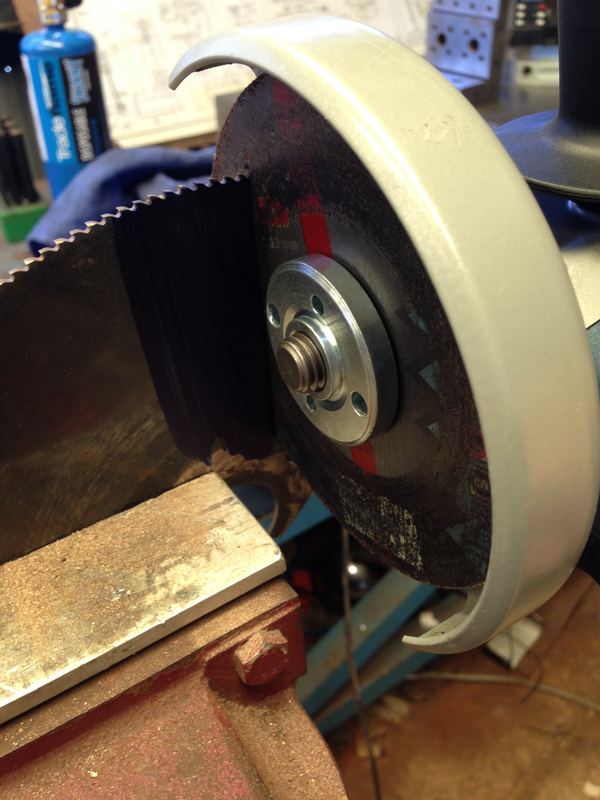 Broken Cold Saw Blades are a good source of Tool Steel! I needed to make a form tool to make the base for the air pump on my triple expansion steam engine. 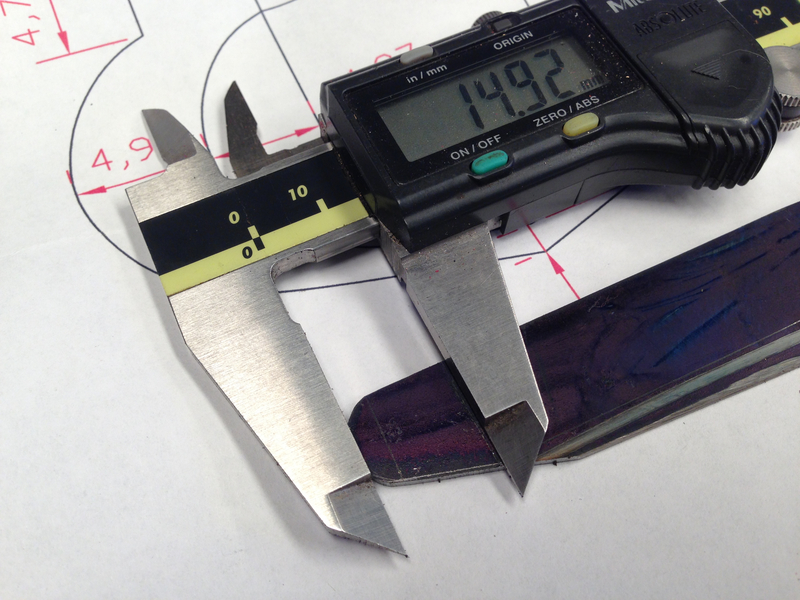 It required a 1/4″ radius section and a 15 degree straight section. 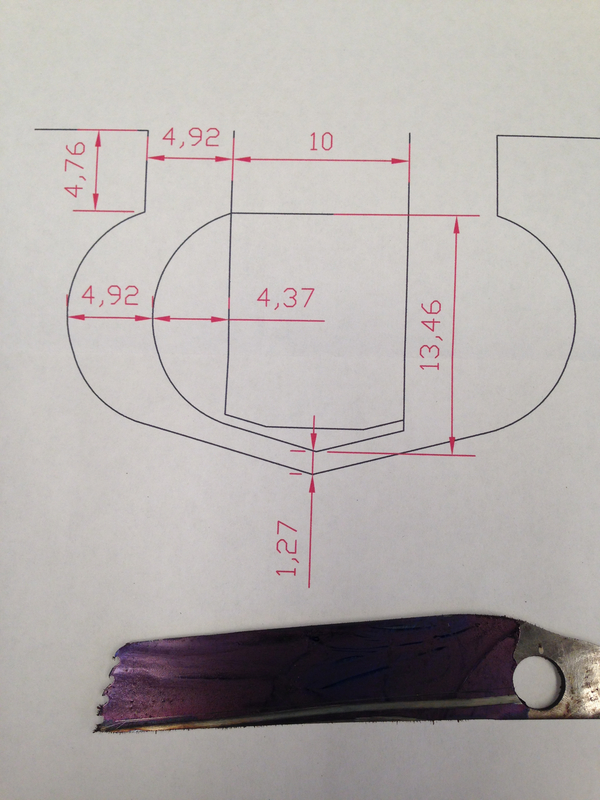 The dimensions for the cavity in the air pump, and the cutter to produce the cavity. 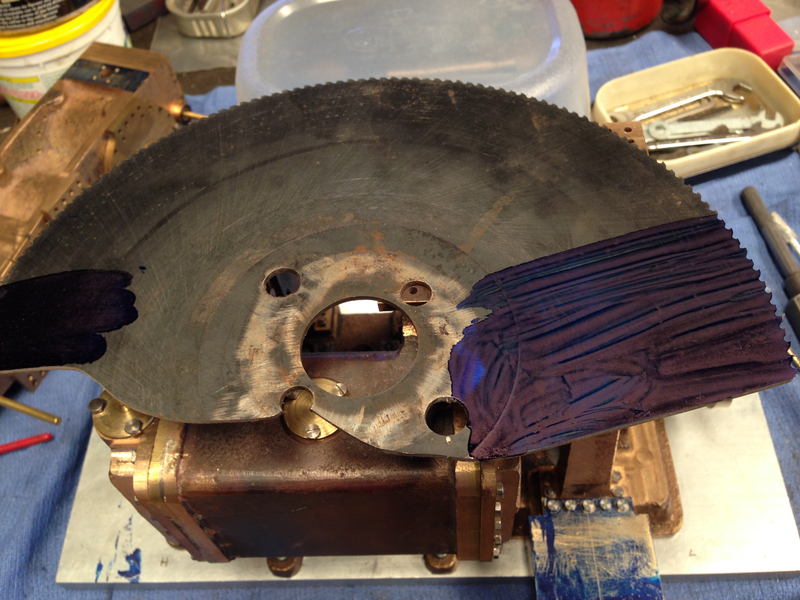 And the piece of cold saw blade which I used to make the form tool. I considered machining the arc and the straight sections separately, but I did not have suitable tools, so I made a form tool. A friend had previously suggested using steel from a broken cold saw blade to make form tools, and on this occasion I used his suggestion. (Thanks Manuel!). 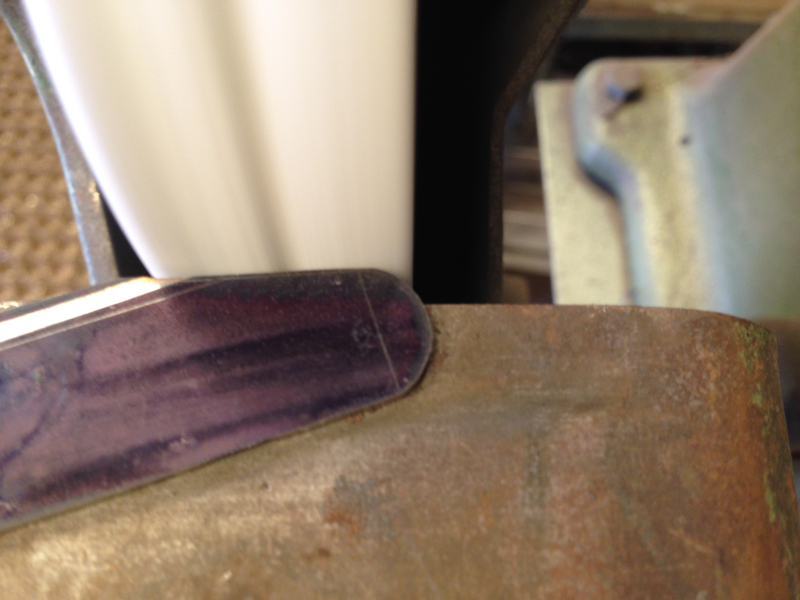 The blade was 1.6mm thick which was ideal. I had some trepidation about cutting it. The broken cold saw blade. The steel is superb. Painted with layout dye. The air pump base is visible lower right of photo, bolted to the engine base. Using an angle grinder with a 1mm cutting disk. It cuts through the cold saw blade easily. Like a hot knife through butter … almost. Grinding the cutter to shape on an aluminium oxide wheel. Grinding the 1/4 inch radius arc. Cutting a 1.6mm slit in 10mm mild steel rod. Initially I fastened the cutter steel to the rod using 2 grub screws, then, after checking the dimensions and the 15 degree angle I cut it to size. 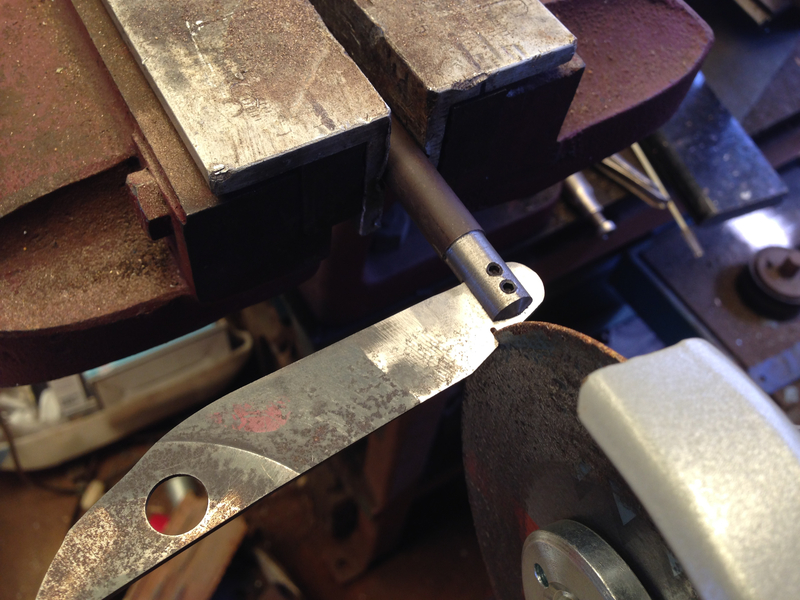 In use, I found the grub screws would not hold the tool steel securely, and I eventually silver soldered the join. The tool, prior to soldering. I ground the relief angles on my Quorn T&C grinder. (See old post). 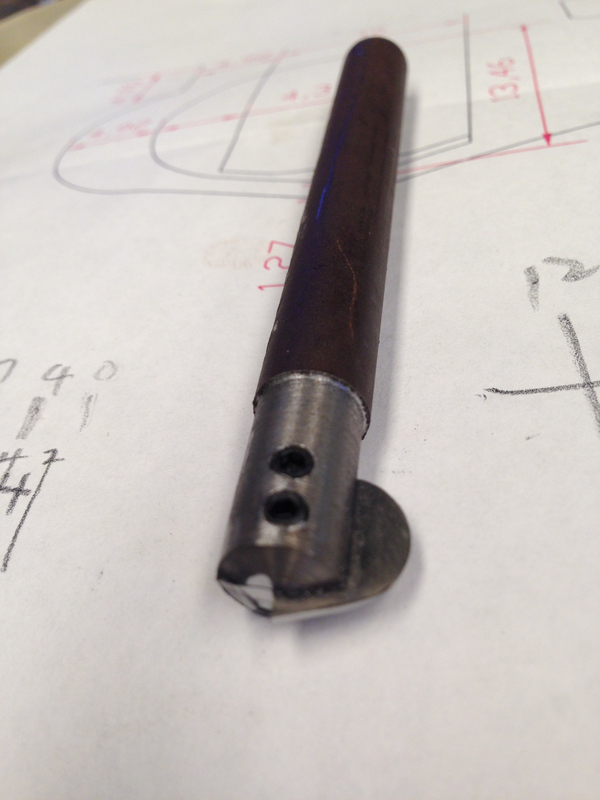 Except for silver soldering the tool steel into the rod, this is the finished tool. Commencing the machining of the air pump base cavity. 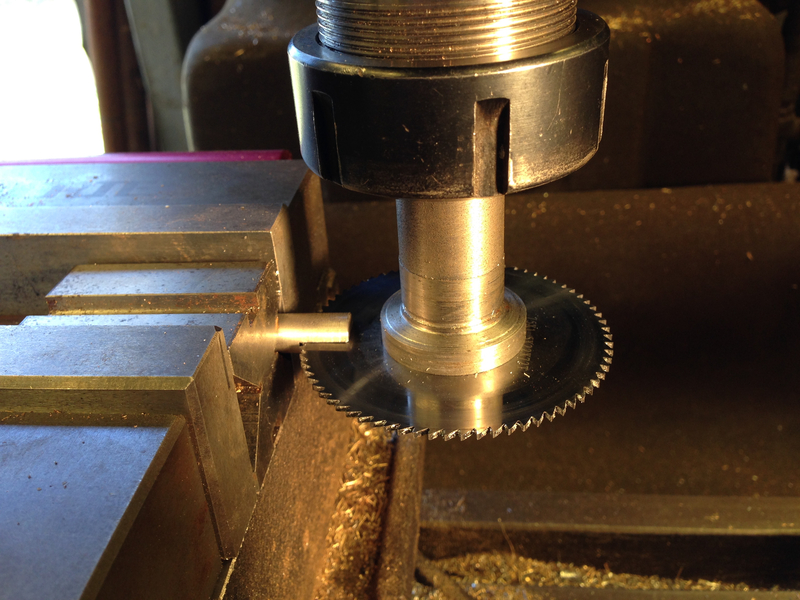 I had planned to do the machining using a boring head on my milling machine, but quickly realised that would not work. So I used the recommended method of a 4 jaw chuck on the lathe. The 45 year old 4 jaw is still in excellent condition. The complex cavity was initially centre drilled, drilled then bored to size. 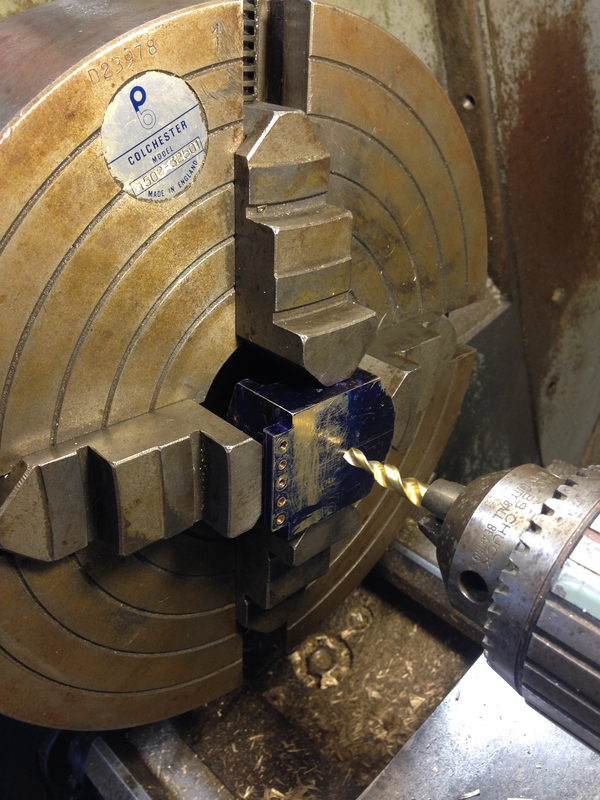 Then the home made tool was used to machine the undercut cavity. It worked perfectly! I learned about using cold saw blade steel as a source of tool steel from Manuel. I am aware of a professional contract machinist who uses this method to turn complex shapes in brass and steel, in preference to using a CNC lathe. The material can be heated to red heat, (during silver soldering) and it does not lose its superb ability to take and retain a sharp cutting edge. Very impressive. bits of broken slitting saws are very useful for making cutters for cutting lines when graduating. The width of the inscribed line being the thickness of the slitting saw blades. Interesting. Do you have a photo showing how you hold the slitting saw piece? if you search my site you will see that for graduating I use a slitting saw as a slitting saw – the graduations are slits. 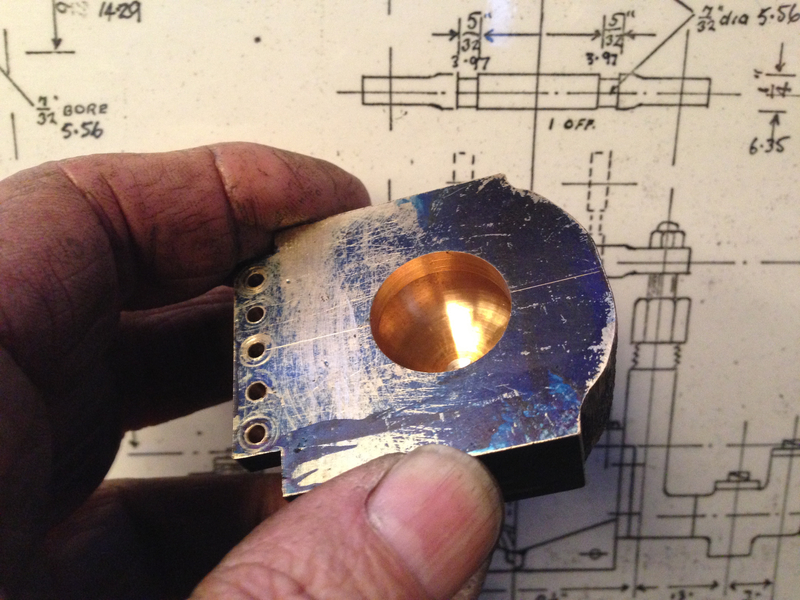 I was on a stand at a me show when another member show me how he did graduating – piece of hss moved along on the lathe. I reckoned that the same scheme with a piece of slitting saw gives an accurate width. 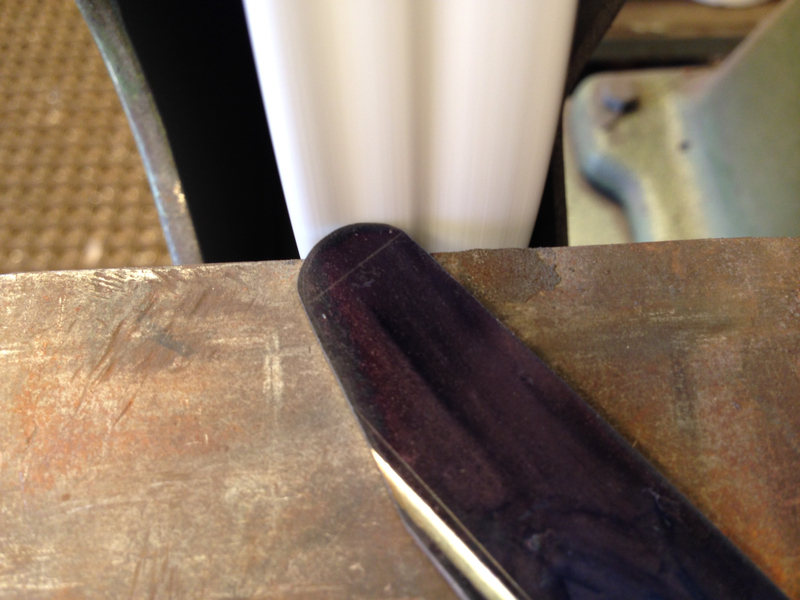 This is important since if the cutter breaks or needs resharpening the line width must stay the same. I have just tried this out and it works. I have taken some photos and will write it up as another web page as soon as I get a chance. That sounds like an excellent solution to the problem of varying widths in graduation lines. I am a little uncertain whether the slitting saw is rotating, or held statically. Look forward to seeing some pics! When I do it the slitting saw is rotating. The way it is done on the lathe part of the slitting saw is ground to form a single cutting edge and is pushed along the surface of the workpiece – you’ll see it on the website. That looks great! Where did you get the broken blade? Unfortunately I have to admit that I broke it when I was unloading the cold saw. However, just about anyone who has a cold saw will have a broken blade or two, and in most cases they will be happy to give them away if asked nicely.